While I headed off to work this morning, Harry got busy with his list of what he wanted to accomplish. We have the plumber coming on Tuesday morning, so Harry wants to get the prep work done before his arrival. We figure that everything that Harry gets done ahead of time is that much less time the plumber will charge us for. Here is the old flooring cut away down to the floor board. Before Tuesday morning, Harry is going to cut this next layer away so that the plumber can get right down to business. To the left of the picture you can see the new flooring with a strip of tape down the edge. Before and after in the downstairs office closet…this is where the plumber will need to get to replace the hardware for the tub. And, if that wasn’t enough, Harry also primed the wall in our bedroom…. Harry was one busy beaver today!! When I got home, it was time to head to my sister’s for another Christmas celebration. (I planned that right huh? ) My mom and stepdad came up today, and we all got together for dinner. Another beautiful day for traveling! The high was around 47 degrees, and still no snow!! This is the view from my sister’s house…. After a delicious dinner and great conversation, it was time to wrap up a fun evening and head for home. Two more days off to enjoy! Brrrr…still no snow, but it’s cold outside! I’ll take the lack of white stuff, though, and every week brings us that much closer to camping season 2012! It’s been a good week – we have been attempting to get the upstairs bathroom done before the end of the month, but it was not to be. Harry started in on the floor on Monday. He did a really great job, especially in the closet area. However, Harry discovered an issue when he removed the base of the toilet to replace the floor in that section of the room. The flange was rusted out. Yes, I have learned a new term. So we have to have a plumber come and replace it. The bright side is that we will have the downstairs tub faucet and drain replaced at the same time. So another item checked off the list. We believe that the rusting was caused by the condensation we have on this toilet every summer. So we went to Home Depot yesterday (again!) and bought a toilet with an insulated tank so we won’t have a repeat of this issue in the future. In the meantime, we bought the paint we need to finish up our bedroom – otherwise known as plan B. We also celebrated the holiday with Harry’s son Andrew this week. Our Christmas dinner tasted just as good the second night! Only a few days left to 2011! We started out on Skype, watching the little guy open a few of his presents. It sure is great to be able to be there from across the distance and share those kinds of moments. After our Skype time, I had some time to do some more personal training time on the Wii. I am trying to get into the routine of making it a part of every day. Some of those Yoga moves are crazy – it’s been quite a while since I could move my body into those positions!! But I guess that just means I will be able to tell I’m making progress. From there it was just a nice relaxing hang out kind of day. We cooked a big turkey dinner, but it didn’t seem hurried at all. We planned dinner for 2:30 in the afternoon so we had lots of time to do the cooking, while we watched A Christmas Carol (the one with George C. Scott – that’s my favorite). You would have thought we had some company coming with all the food we laid out for the spread. After dinner, we actually went outside to take a walk. The thermometer said something like 42 degrees, but the wind was cold. So we only went one lap around the development, which is a half mile. And then it was more relaxing for the rest of the day. The cats got into the spirit of things. Hope everyone out in Blogville also had a great holiday! Well, I’ve had my cup of tea, so without further ado, I believe I will return to this night’s regularly scheduled programming… …good night all…. Merry Christmas everyone! We’ve had a great Christmas weekend so far, and today promises to be another wonderful day. Yesterday was a busy day. I had my usual Saturday morning at work and it was pretty quiet. Most people were not running to their local credit union to do their business on Christmas Eve. After I got home, I had some fun on our Wii, trying in advance to burn off the calories coming my way today! Then I decided to get a head start on today’s cooking. I made the dressing, and then started on dessert – Pumpkin Walnut Cheesecake. Rub bottom and side of springform pan with softened butter. Pour in crust mix and turn pan so that the mix adheres to the bottom and side. Leave excess crust mix on the bottom of the pan. At medium speed beat cheese and sugars together. Add pumpkin, spices, eggs, and heavy cream. Beat for about 3 min. Pour filling in to prepared pan. Bake in a 325 degree oven for 1 hr., 35 min. For topping, beat butter with brown sugar. Stir in chopped walnuts. Place topping on cake, shut oven off, leave the cake in the oven until oven cools (at least 1/2 hour). Our fridge is full, so for once the cold weather came in handy. The temperature in our garage last night was 38 degrees, so we were able to cover the cheesecake and put it out in the garage for the night. This morning I brought it in, and released the side of the pan. Hopefully it tastes as good as it looks! Hope everyone out there has a wonderful and blessed Christmas Day!! Yes, I am once again raving about this awesome weather! It was a balmy 48 degrees tonight when I came home from work. So Harry and I decided to take a walk around our neighborhood. Here I am, on my way back into the house tonight after enjoying a great walk. Harry took a few pictures of the Christmas lights. Our neighborhood looks very festive! Only one day left before Christmas Eve…ready or not here it comes. Today was a very nice day off. I made my usual after payday trip to Walmart for groceries. We are beginning the third week of a new way of meal planning. Over the past months, I noticed that a lot of our meals had turned into pre-made, processed foods, like breaded chicken, fish, tater tots and those meals in a bag. There were many times when I would come home from work and have no idea of what sounded good for dinner. So I would dive into the freezer and pull out something that you could turn into a complete meal in 11 minutes or so. Usually something that had a gravy and probably more salt content than I would normally use in cooking in a week or more. Well, about a month ago, I decided that I needed to make a change. Hopefully also one that was a little more healthy. So I came up with a plan. I decided that I would plan our meals two weeks ahead. For the most part, I find a meat, a salad and some kind of veggie for each meal. I have been scouring cooking sites for dishes that sound good and relatively quick and easy to make. Then, as I come up with a plan for a day, I compile a shopping list for everything I need as far as ingredients. So I thought for today I would share the recipes for today’s dinner. over & chill for 24 hours, stirring once or twice. Sprinkle with stuffing and parsley. The meat dish was Lemon Pepper Chicken Breast. It was fried, so not completely the most healthy choice. So although it was tasty, I definitely won’t be making it frequently. Melt butter in skillet. Wash chicken and dust with flour. Season well with garlic and pepper. Brown breast in butter. Continue cooking until chicken is done, turning frequently. Pour lemon juice in skillet. Simmer 2 minutes on each side. 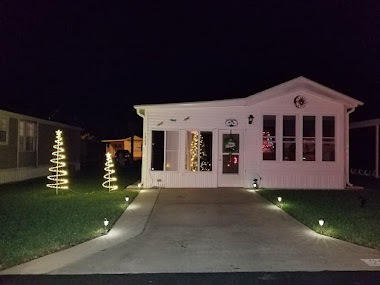 An Awesome Christmasy Weekend–Minus the White! Yes, this is our view from our front window, and I love it! So far this winter has been a welcome reprieve after last year’s. This was December last year. I know there are several months left to the season, but I am enjoying every single day without the white stuff while it lasts. Other than the weather, it’s been a nice Christmas kind of weekend around here. The first great thing about this weekend was that I had Saturday off! Two solid days off! What a nice treat! And yesterday was a great day, as we traveled over to my sister’s house for our holiday get-together. The kids were excited about their gifts. We had no idea what a project it would be to put this marble mania thing together. Wow! But the end result was worth it. We got a few very cool and useful gifts as well. which turns into this great table! a cover for our hitch! After we left my sister’s, we went in to Albany and saw the new Twilight movie, which was great fun. I enjoyed watching all the shoppers scurrying about doing their shopping, and knowing we had nothing else left to buy. That was an awesome feeling! Today has already been productive as we have painted the second coat on the bathroom. And now I am settling in to watch the Giants game. Edit: Ok, so let’s just say the Giants game was NOT the highlight of the weekend.